Fashioned by fifty years of continual technological progress, the Classic stays true to the traditional strengths of the original Zodiac - security, stability, durability - but is faster and has a larger cockpit space. 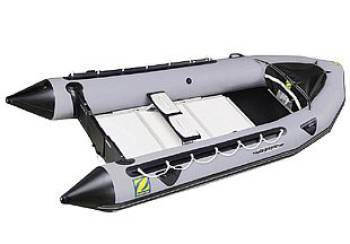 Its inflatable keel optimises performance while the oversized buoyancy tube increases stability; the boat planes quickly even with a modest sized engine. Folded in its carrying bags, the Classic follows you wherever you go, fitting easily in the trunk or on the roof of your car. Inflate or assemble the floor, according to the model chosen, then inflate the buoyancy tubes and get family and friends on board for a fishing trip or just for a ride. Reassuring and easy to maneuver, you could dream of nothing better than the Classic. Overall length 4,20m, Overall width 1,83m, passengers 7, Total weight 83kg, Max. power allowed 40hp.